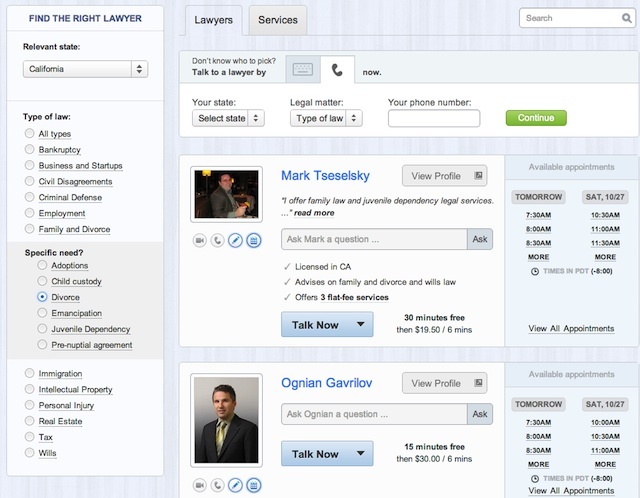 Companies like LegalZoom try to replace the basic services offered by attorneys, but sometimes you still need to talk to a real, live lawyer. So a startup called Lawdingo makes it easier to find one. When you visit the Lawdingo site, you search the site based on your legal situation and your location. Then you get a list of applicable lawyers, along with their Yelp ratings (Lawdingo is also building a review system of its own) and their rates. You can schedule an appointment to talk to a lawyer directly from Lawdingo, either through video (using TokBox) or voice chat (using Twilio). If they’re online, you can even hit a “talk now” button. The main selling point of Lawdingo seems to be convenience — you don’t have to track down an attorney, schedule an appointment, then drive across town to meet them. But even though the company allows lawyers to set their own rates, founder and CEO Nikhil Nirmel said it can still save users money. For one thing, lawyers are encouraged to offer free consultations for a duration of their choosing (the average is 20 minutes). For another, users can consult with lawyers even if they aren’t nearby, giving them a broader selection and potentially connecting them with lawyers who charge less because they live in lower-cost cities. Lawdingo makes money by charging lawyers a flat monthly fee. Nirmel said that if he charged a transaction fee, then lawyers would have a financial incentive to move the relationship off Lawdingo and onto phone or email as soon as possible. He also offers a moneyback guarantee for the first month, and he said no one’s asked for a refund yet. There are currently 205 attorneys located in 36 states using the platform, Nirmel said. Five hundred live legal consultations have been initiated on the site, 180 appointments have been scheduled, and 1,550 inquires have been submitted. The most common type of inquiry? Family and divorce. Lawdingo has raised about $100,000 in seed funding from Yodle founder Nathaniel Stevens, Safe Shepherd founder Robert Leshner, Rohan Srinivasan of Google Finance, Causes engineer Adam Derewecki, and others.